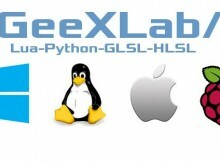 GeeXLab 0.9.5.0 brings to all versions the features added in v0.9.4.1. This new version brings also the support of NanoVG, an antialiased 2D vector drawing library for UI and visualizations. I will post more details about this support in an upcoming article. The Python plugin has been updated with all functions recently added in the Lua (built-in) plugin including all Direct3D 12 and NanoVG functions. Now all versions of GeeXLab can do an online check of newer versions (I disabled this functionality in the Raspberry Pi version because under some circumstances, the whole system can be blocked). And on Raspberry Pi, the OpenGL version is forced to 2.0 (OpenGL ES 2.0) even if you specify 3.2 in the window XML node. the version specified in the window XML node. + [OSX / LINUX] added online checking of newer versions of GeeXLab. + added new gh_nvg lib to bring support of NanoVG (lua / python). in gh_mesh lib: klein_bottle, trefoil_knot, etc. ).